Road to the Code with Less Bugs? I think that writing any non-trivial software without introducing bugs is close to impossible. World is complex, data used in programs is complex, handling all possible interactions of our code with said data is hard. There are probably bugs even in the short script that is accompanying this article. Sounds dark? Maybe it shouldn’t. Everybody who writes software is creating bugs, it is inevitable. There is huge amount of research about what causes bugs and there are various results and conclusions. My interpretation of the surface reading is that number of “bugs per line” is scaling in some way with total number of lines in program. For example, program with 1000 lines will have one bug, program with 2000 lines will have 3 bugs, and program with 50 000 lines will have 100 bugs. Personally, I feel like that is true as it kind of matches my experience. Programmers mostly agree about this. There is also something called cyclomatic complexity (amount of logical branches code can take). Make objects/variables which are always in valid state. Maybe by using static declarations, there will be another article about how PHP7 is improvement over PHP5 here. Make sections of code smaller and easier to understand. Perhaps by reducing number of branches and loops. Reduce overall amount of code. Perhaps by using higher level constructs, so we write less code. Honestly, I am not really sure if such ideas will really work. So far, my feeling is that it helps a lot. Maybe it will help more when I get more experience, maybe it is actually worse and I lack knowledge/skill to see it. But I can see there is lot of space for improvement. And I am very confident that we should at least examine some of the options and see how they work in practice. So, in this teaser post, let’s do something everybody enjoys! Parsing CSV files, and doing some analysis on that data!!! 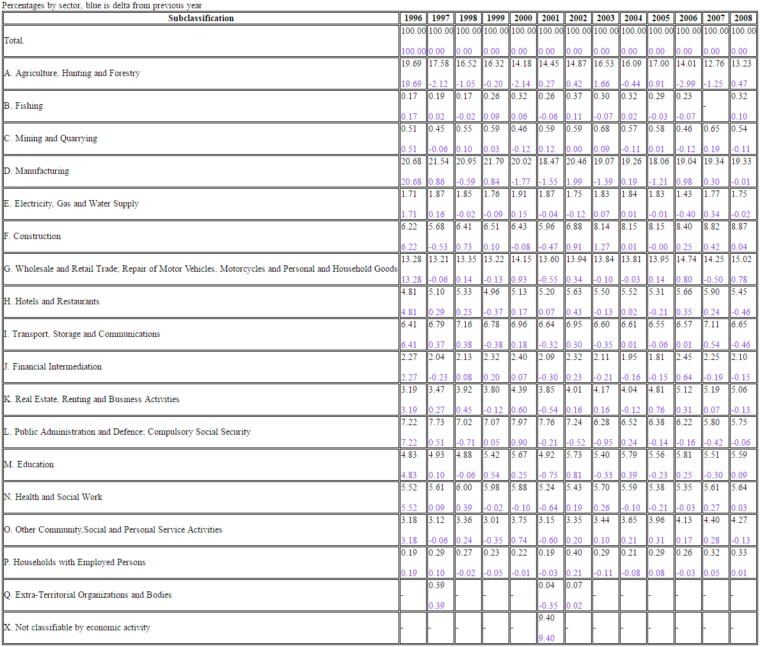 Input: CSV with UN employment data. Rows with years, work sectors and number of people working in each sector per given year (in 2002, there were 100 000 people working for the Government). Output: Statistic with percentages that show how many people worked in some sector for given year, and how those percentages changed over years. For the first post, we are going simple, only showing data for one country and for both genders. That gives us excuse to introduce generators. 🙂 Our goal is to show the table in HTML (ugly looking table but we won’t be concerned with styling, only with filling table with proper data). Performance is secondary goal, and it will not be tackled until we are satisfied with the code quality. Corectness and crash-resistance are primary goals! I will quickly show uses of some of the concepts and we will try to improve code as series go on. Not sure where we will end and if functional style is good fit for the problem overall but let’s see where it will take us. Along the way, we’ll also see if functional in PHP will be easier to understand than the same thing implemented in OOP way or old-school imperative approach. We will start with closures. Closures are good for encapsulating data, without going full on object-oriented. Goes like this – you create some function which will have some data saved, and you can later call that function (with new parameters too). Example function is accessing values of CSV data rows by column names defined in CSV header line. * Creates dictionary-like closure which accesses array values by string keys. Generators are like iterators/array, but differ in the fact that they will give you data only when they are told to do so. We can use generator to read huge CSV file line by line, and we only take lines that we need. For now, you can think of keyword yield as “feed (return) value into caller, but save state of generator function for when it is called next”. Generator is somewhat like closure, it can also have some local variables saved for later usages. Let’s create instance of a generator; we are still not asking it to read data from CSV. Next, we will not need all rows from CSV, only a few. Let’s pretend that we do not have the database system in which we can import data. Filter rows as we are only interested in data for one country and for both genders. It would be wonderful if we could somehow delay reading of the CSV rows to the point when we actually need them. CSV file is still unread!! We did not actually use the values, we only specified that the values we will use will have to satisfy some condition. Instead of creating an array and then inserting rows from some foreach, we only said that $stats will give us rows that satisfy some condition when we ask for them. Next step, I think that we will need to group values by work sector and year if we want to display them in a table. Higher order just means function that accepts other function in a parameter, nothing actually fancy. Word group sounds like it should be a function, but there is not one such in Nikic’s library. It has group, it seems it can only do one level of grouping with one call. There is some advanced stuff in the library Lars made so maybe we can do some mumbo-jumbo when we revisit the code and refactor it to compose function that will group by two levels. First we group by work sector (subclassification). And then we do something that is actually elegant, but looks weird if you are not used to it. Map is kind of like foreach, but it is not supposed to modify collection it is iterating over. Think of it like: map = foreach item: call function “a” and return items function “a” returned. Function “a” will accept one item from the collection, do something and return one item. Map will return array of all items function “a” returned. So, with our grouped entries we will call function (which accepts all entries that fall under one Subclassifiction). That function will first create a new array which will have “Year” of entry as a key and after that go over all elements and get ‘Value’ only for each row. Honestly, in PHP foreach seems easier at first, even to me. sort($years); // Why is this bad style? // can this part of code be improved by using functional style? Article turned somewhat different than I expected. Having nicer lambda syntax would improve readability so much. Closures are great in limiting local scope, generators are really nice to use, in some other languages they require more syntax. Nikic does wonders for PHP. We have nicely formatted data, look at this design masterpiece!